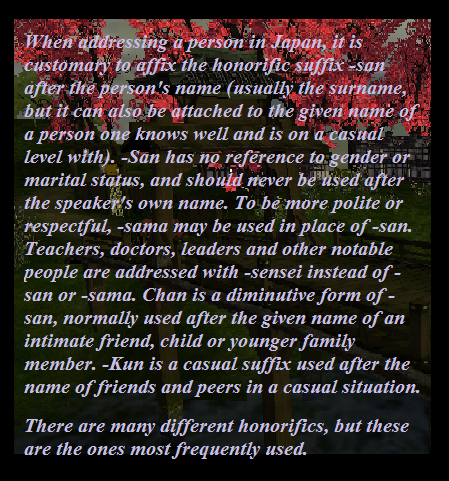 Japanese use different words to indicate whether they are talking about a member of their own family or someone else's. The words used for another person's family are more polite, and can refer to the person being addressed or to some other person to show respect. In the following list, where two words are shown for "my family," the first word may also be used to refer to fathers, mothers, etc., in general. Also, in the words ending in "san," you may replace that suffix with "sama," in order to show more respect to the person. * A Japanese wife often calls her husband "anata," which literally means "you," but is used in this case to mean something like "dear" or "darling." Likewise, the husband may refer to his wife as "omae" or "kimi," both of which are also translated "you." These terms are used in place of the person's name.